Copacabana Beach (in Portuguese: Praia de Copacabana) is a famous beach in Rio de Janeiro, Brazil. It was one of the three landmarks in Rio that Koopa Troopas stole artifacts from in Mario is Missing!. They took a Copacabana Beach Seashell from the beach, and Luigi's task is to find and return it. He receives 1,350 dollars for returning it. 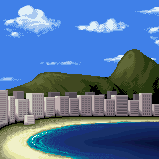 Copacabana Beach also appears as the hub world in Mario & Sonic at the Rio 2016 Olympic Games. Pamphlet information from Mario is Missing! Going to the beach is an art form in Rio. There are different sand spots for tourists, the young and the old, the rich and the poor. Certain beaches around the world are well-known for surfing, shell collecting or, as in this case, for people-watching. The world's most famous beach, Copacabana curves 4.5 kilometers into Guanabara Bay. It sits in front of the world's most densely populated urban area. Those who know say that on any summer weekend, upwards of 100,000 people will spend some time on Copacabana beach. This page was last edited on March 29, 2018, at 17:41.